Hmm, interesting. I've been told it's important to keep them spinning to clear the tread. There is only one road from Nigeria to Cameroon, and even in the dry season it's severe mud and usually almost impassable for a regular 4x4 without help from massive trucks. It's one of the reasons I went with the Rubicon, winch etc. It will be very interesting to see how the A/Ts perform, I'm looking forward to it! KOs are a great all round tire. And they last forever. I'm on MTs, 255/80R17s... If they were KOs I'd get an extra 2 years out of them. I really like that size. That's for sure what I would have gone with if I went with Mud Terrains. I spent the whole weekend wrenching on the Jeep while it was sleeting outside. 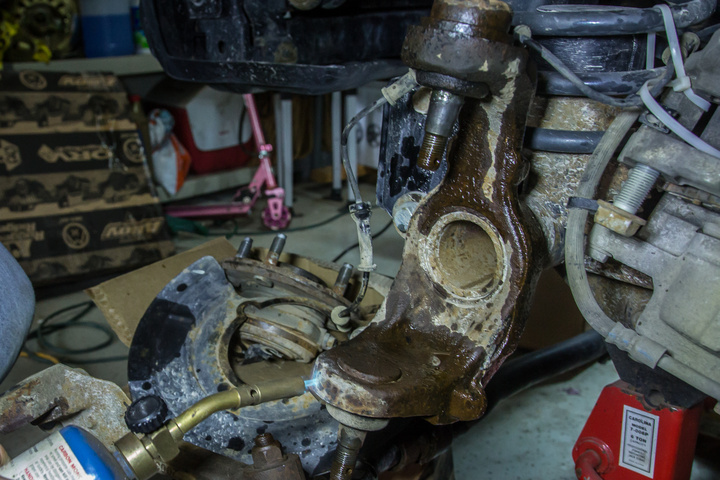 On the advice of many, and with the help of the editor of JPFreek Adventure Magazine, we installed Rugged Ridge HD Ball Joints, U-Joints, Tie Rod Ends and drag link end. While we were in there we put on new unit bearings so I don't have to think about them again for the whole trip. The old ball joints took some convincing to come out! We then installed a Rugged Ridge engine and transmission skid plate, which is very beefy and give me great piece of mind I won't crunch my oil pan. Also put on all-steel black lug nuts and locking nuts. None too soon either, the crappy plastic caps were falling off the OEM lugs and were very hard to get off. Finally I put on a set of neoprene seat covers. I need to get moving further East, aiming to ship before the end of the month. yea, those tires would not be my first choice. 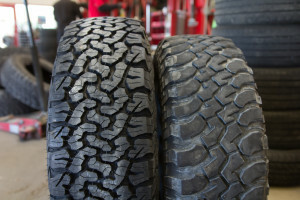 you will want the most robust tire you can get. you will seldom be on any well paved roads. 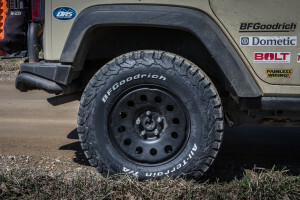 you're better off with agressive offroad traction and strength, and sidewall protection for things like sharp rocks, glass, etc. and mud, there will be no shortage of mud, of which the Mall-terrains are not great in. I second the MTRk suggestion. you certainly won't need 50k of road rating since A) you're going to be on dirt more than asphalt, so they tires will wear less anyway. B) you'll end up having to replace them 3 or 4 times anyway just because they will get destroyed, no matter what kind of tires you get. the ivory coast is fairly dangerous for westerners, and you're pretty much guaranteed to be killed in The Sudan, Egypt, and Libya. Personally, I would not be taking a newer jeep over there. nobody over there is going to know how to work on it, and parts will be pretty much nonexistant. you're much better off with a 80s or 90s toyota. Sounds like a fun trip, not an ideal choice of vehicle. Might want to consider something a little more under the radar like an older 4x4 econoline or an older, ISIS approved Toyota w/a shell. You're almost certainly going to get car jacked in a high profile vehicle like that. And what my good friend above said, absolutely do NOT go there with an AT. Get some Kevlars. Even some bias plys would not be a bad choice. Hell, they might even keep you moving if someone tried to shoot out your tires. 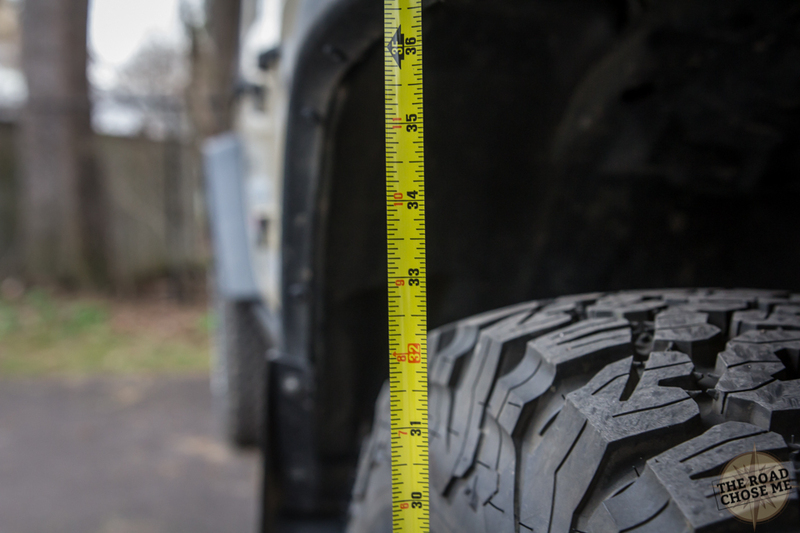 SX D rated swampers can run on about 3 pounds of air without much difference in the sidewall. Not sure what brand of neoprene seat covers your considering, or why...but they're terrible. I had a set on my JK and all they ever did on long drives in excess of 500 miles was give me a bad Charlie horse on my inner thigh. I'm going to have to disagree with my colleague above. go for a Delorme from Garmin. I used to have a Spot, we ditched it in favor of the delorme, way more features and support. Either or dude, I was just using it for a reference of what to get. Fastest link I could scrounge up for the man. Oh yea, I don't know if you put much thought into it...but you might want to considering upgrading to some chromolly shafts and keep your old ones as trail spares somewhere in or strapped to the vehicle. Highly unlikely you'll brake anything with your setup, but if you did, you're be up s*** creek real quick. Lots of great work being done. Look forward to seeing more! My JKUR is heavy, I have not weighed it yet, but likely 5500-6000lbs I think. I'm running 36 psi in the tires. 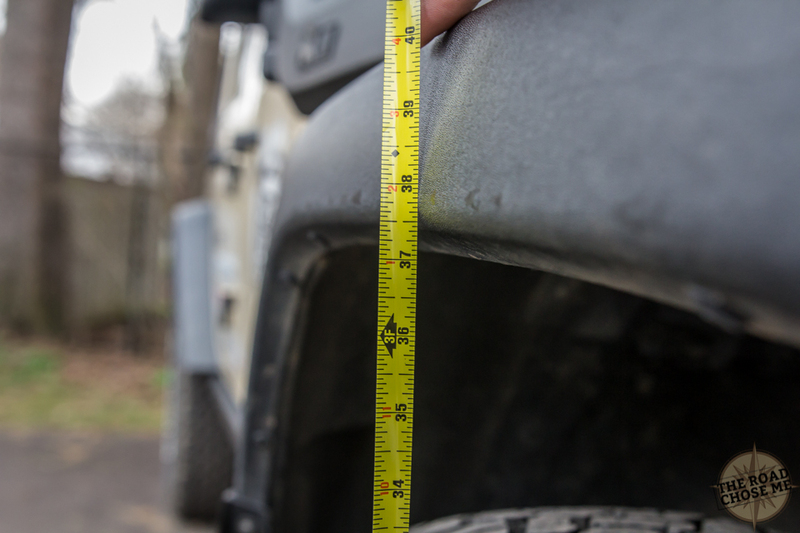 It was hard to hold the tape and the camera, the tires are 32" or maybe 32.25" at the highest point. Let me know if there is anything else you want. Height wise these are absolutely perfect for me, I am very, very happy with them now I've put a thousand miles on them. Over the last couple of days I drove over to Nova Scotia, I'm organizing shipping to Europe now. For 1000 miles I kept the cruise at 62 mph. Big rolling hills on the highway, some requiring 5th gear. The Jeep is now at full expedition trim and weight with the top, tires, wheels, lift, full tank of drinking water and all my stuff inside. Using GPS speed and distance I hand calculated 18.4mpg (US). 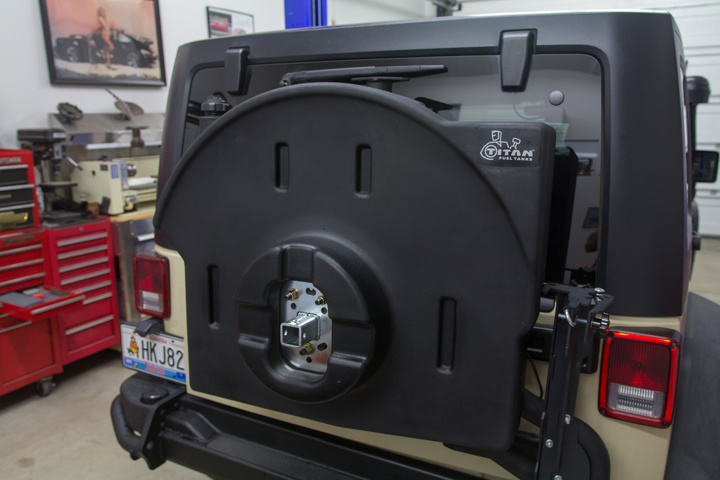 With the 13.8 gallon Titan Fuel Tank mounted to the tire carrier my total range is ~650 miles. I'm very happy with that! I wonder what kind of mileage it gets on the leaded crap gas you'll get in most of africa. Having spent a lot of time in africa, I would never attempt to drive a nice Jeep around there as a white person.